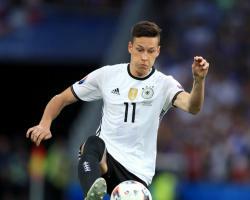 The Wolves only signed Draxler from Schalke last summer but the Germany international is being linked with a move away from the Volkswagen Arena, with Arsenal among those clubs reportedly interested in his services. "There is no discussing that." The same cannot be said for Draxler's Germany team-mate Schurrle, however. The 25-year-old has attracted the attention of Borussia Dortmund and Allofs cannot guarantee the former Chelsea forward will remain at Wolfsburg. "But Andre has told the coach quite clearly that Borussia Dortmund's interest has got him thinking. It's not unlikely, therefore, that Andre stays with Wolfsburg."